New study on R&I perspective of potential for Advanced Biofuels in Europe available! 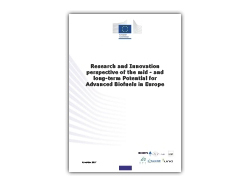 A study titled “Research and Innovation perspective of the mid- and long-term Potential for Advanced Biofuels in Europe” has been published by the EC, DG Research and Innovation. The study, developed by a group of high-level organizations (associations and consultancies), is aimed to contribute to future policy developments in the area of advanced biofuels. compare different fuel options for transport.